The Wignacourt Aqueduct, looking grand but missing the various colours of the profusely flowering oleander trees that grew against each arch. The surviving section of the Wignacourt Aqueduct is at last getting a much needed restoration but because of the damage that they were said to be causing to it, profusely flowering oleander trees have had to be removed. Almost every arch of the aqueduct had an oleander tree growing with it, which at this time of the year would be in full bloom, adding a vibrant splash of colour to the stone structure. It was seen necessary to remove them. A spokesman for the Infrastructure Ministry said the trees were causing damage to the aqueduct, and they were therefore removed. He said most of the trees were replanted elsewhere and a general cleanup of the aqueduct was being done by the Restoration Unit. 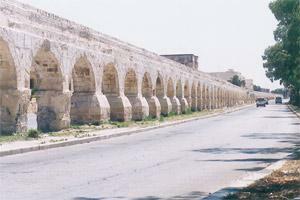 Birkirkara mayor Doris Borg said the work was being done by the Restoration Unit in collaboration with the four local councils which were responsible for parts of the aqueduct. She said the Birkirkara, Balzan, Attard and Sta Venera councils were paying for the works. The aqueduct was built in the early 17th century by Grand Master Alof de Wignacourt to transport water to Valletta from the natural springs and sources in the hilly region around Mdina.